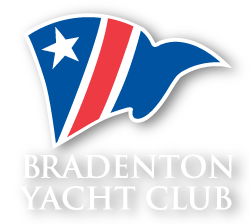 The Bradenton Yacht Club is one of the original 13 members of the Florida Council of Yacht Clubs (FCYC). The current membership of FCYC is 36. They are located along the Florida coastline from Pensacola to Jacksonville. All FCYC clubs are member owned. The primary FCYC benefit to BYC members is reciprocity. This is the practice of allowing discretionary use of a Council member club’s facilities by a member in good standing of another member club. In practice, BYC members can use the facilities of the 36 member clubs for dockage and dining. FCYC reciprocating members can charge expenses at the clubs they visit to their home club. FCYC also serves as the governmental liaison between the yacht club community and various branches and departments of the state and federal governments and legislature.